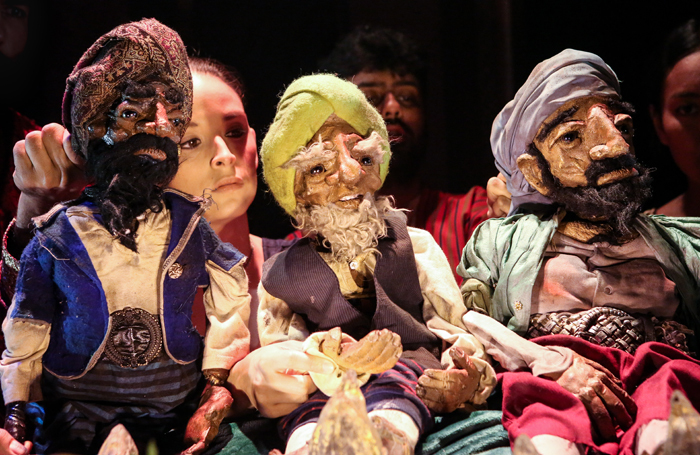 This play is a careful selection of Middle Eastern folk tales, also called One Thousand and One Nights. The plot follows Sharazad, whose power of storytelling helps King Sharyar find a bit of humanity within himself. “It will be a pleasant evening”, I think to myself. “Everything will feel comfortable. Comfortable. My friend will enjoy the costumes and the pretty set.” Slowly, as each and one of the stories unravel, I realise that this is actually a really well-crafted series of stories, and they’re told well. It’s funny how these ancient tales actually transport us to earlier times. Every tale uses different theatrical devices, and each of them enrich the collection even further. Puppets, masks, and everything in between creats an exciting, eclectic, yet coherent piece of performance. If I close my eyes and I picture One Thousand and One Nights, this production will stay in my mind for a long time. Arabian Nights runs through 13 October.